We are having new babies in the family! Not me! Thank goodness! My sister from another mother, my husband youngest brother’ wife is pregnant. To top this off my husband’s girly that works for him told me today she is also having a baby, both moms are due in July! I’m holding thumbs for girls! So prepare yourself, the next few months it is just going to be baby, baby! Now for the blanket wave! I’m going to share with you all the blankets I have crocheted over the past 4 years! Yarn: Sirdar – Calico, double knitting, crochet on a #4 (UK) 10 (US) hook, size without border 42½” x 47” or 1.08m x 1.20m. Pattern: Lucy @ Attic 24 – Granny stripe. My guest room blankie was my first crochet project! Yarn: Elle – Pure Gold, double knitting, purchased @ Wool and Weave, crochet on a #4 (UK) 10 (US) hook, finish size 62” x 71” or 1.58m x 1.8m. Pattern: Class, this pattern is very similar, African Daisy. Yarn: Elle – Pure Gold, double knitting, purchased @ Wool and Weave, crochet on a #4 hook, finish size 30” x 52½” or 76cm x 133cm. Pattern: I hope to share this pattern with you shortly! So watch this space! Blue Square, this one I used 14 colours and added the blue for the sashing and the border. Yarn: Sirdar Snuggly – Baby bamboo, double knitting, purchased @ Wool and Weave and Arthur Bales, crochet on a #4 hook, finish size 49” x 52½” or 1.25m x 1.34m. Pattern: Lucy @ Attic 24, border was the same as the square pattern crocheting all around with a picot edge. Colour Ripple I crocheted with Lucy from Attic 24 in 2012. I used 7 colours for this blanket. Yarn: Sirdar Snuggly – Baby bamboo, double knitting, purchased @ Wool and Weave and Arthur Bales, crochet on a #4 (UK) 10 (US) hook, finish size 45” x 72½” or 1.15m x 1.84m. Pattern: Lucy @ Attic 24– Neat Ripple Pattern. Pink Wave was crocheted to please my girly side and for when my husband’s niece come for a sleepover. Yarn: Sirdar Snuggly – Baby bamboo, double knitting, purchased @ Wool and Weave and Arthur Bales, crochet on a #4 (UK) 10 (US) hook, finish size 45” x 68” or 1.15m x 1.73m. Pattern: “200 Stitch patterns for Baby Blankets” by Jan Eaton (#6 Interlocking colors), border pattern from “Around the Corner, Crochet Borders” by Edie Eckman (#130), both books are available from here. Rainbow strips was crocheted with left over yarn from all my previous projects and yarn that I had purchased in the in between stage of crocheting the other project! Yarn: Sirdar Snuggly – Baby bamboo, double knitting, purchased @ Wool and Weave and Arthur Bales, crochet on a #4 hook, finish size 48½” x 68” or 1.23m x 1.74m. Pattern: Lucy @ Attic 24, Granny stripe. 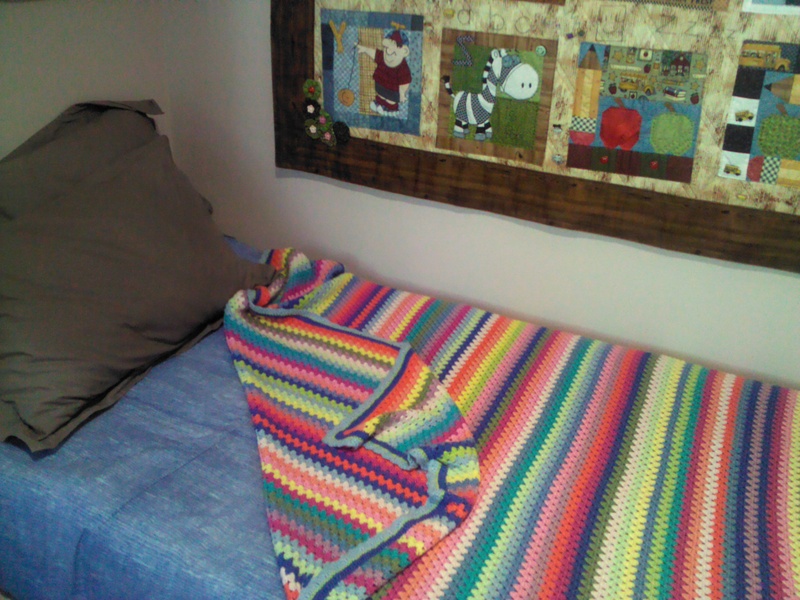 My big bed blanket was crocheted for my bed, this I started around Easter 2012 and completed it in the second week of November 2012! Great joy! Yarn: Sirdar Snuggly – Baby bamboo, double knitting, purchased @ Wool and Weave and Arthur Bales, crochet on a #4 (UK) 10 (US) hook, finish size 82½” x 98” or 2.10m x 2.50m. Pattern: Lucy @ Attic 24– Neat Ripple Pattern. Side border was from “Everything you need to know about crochet, A-Z of Crochet” (Crab stitch), book available from here. Well I hope I have given you all some inspiration to start crocheting! This entry was posted in Crocheting and tagged buzyday, Crochet, Crochet African Daisy, Crochet Granny squares, Crochet Granny stripe, Crochet neat ripple, NikkiM. Bookmark the permalink. Hi Nikki, thanks for visiting my blog. Your blankets are gorgeous and you have definitely made me want to start crocheting again. Unfortunately there’s only so much I can squeeze into my day, it’s so unfair! I know! So much to do and so little time! I enjoyed visiting your blog.